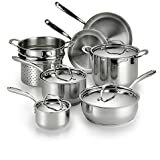 Everyone deserves a fantastic cookware set in their home, to prepare and have fun cooking meals. A cookware set should be hard wearing and hopefully last you a long time. One popular choice of cookware at the moment is that of the nonstick pan. This just makes cooking and cleaning up afterwards so much easier, especially if you are a busy person with a family to care for. These things matter! One newest addition to the nonstick cookware brigade is by Anolon. 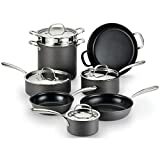 Their hard anodized nonstick 11 piece cookware set will be fully reviewed below. The following are the most features of Anolon Advanced Hard Anodized Nonstick 11-Piece Cookware Set. The entire cookware set is comprised of hard and durable anodized aluminum. This ensures that it can withstand oven temperatures up to 400 degrees F. It will also hold its shape well and will not easily warp or corrode. Aluminium is also a safe metal on which to cook and will not leach any toxins. 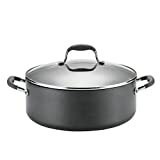 As well as the anodized aluminium being strong and durable, it is also a fantastic conductor of heat and will thoroughly cook your food, with very little chance of hotpots occurring. Each pot and pan in this cookware set features a specially constructed Autograph coating. This ensures that the surface of the pan, both inside and out is nonstick. This creates the perfect coking atmosphere in which to cook your food. The pan reaches its optimal temperature quickly and food will cook in its own juices, with no need to add extra oil as the surface is already prepared. Cooking the nonstick way is also perfect for searing meats ad fish. The handles within the cookware set are Sure Grip and are riveted for extra stability and safety. They have been ergonomically designed so that when holding them for long periods, they will still be comfortable to hold. These long handles are made fro, stainless steel so can become hot while sat on the stove cooking. 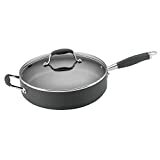 However the metal handle has a rubber silicone covering ensuring that you will not burn your hands while manipulating hot pans on the stove or into the oven. The cookware set features glass tempered lids that are break and shatter resistant, so are completely safe. They can withstand temperatures up to 400 degrees F, so are safe to use in the oven, so perfect for when you need to transfer cookware from stove to oven. The glass lids are domed, for extra room in which to steam food. They also feature large looped handles for easy grip, allowing hands not to touch the hot glass. Being glass, this also allows you to easily see food while it cooks. This cookware has a wide variety of cookware available for everyday use. 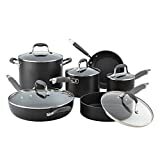 The set features: a 1.5-quart pan; a 3 -quart covered sauce pan; an 8 quart covered stockpot; an 8.5 inch French skillet, a 12 inch skillet and a 3 quart covered sauté pan. Therefore you can create a variety of meals with this diverse range. All are suitable for oven use up to 400 degrees F and can also be placed into the freezer for easy storage. The insulated covering on the handle does not extend all the way to the base. Q. Can this set be paced in the dishwasher? A. It is recommended by the company website that you hand wash only. Q. Is the set induction ready? A. This cookware is not suitable for induction cooking. 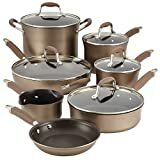 This Anolon anodized aluminium 11 piece nonstick cookware set is incredibly diverse and fantastic for the busy family. You can create a wide range of meals and can do so easily. The food cooks thoroughly and there is no chance of your food sticking or burning. Even though it is recommended that you do not use a dishwasher, the set is very easily washed by hand. It is safe, easy to use and cooks food wonderfully well.